For help with product accessibility, see Accessibility features. To access the most current product documentation, start at the library index. For tips on searching, providing feedback, and more information about using the product documentation, see How to use the docs. Send a smile: Send feedback on what you liked. Send a frown: Send feedback on what you didn't like. Send a suggestion: Takes you to the UserVoice website to share your idea. In the upper right corner of the console, click on the smiley face. In the drop-down menu, select Send a smile. Use the text box to explain what you liked. Choose if you would like to share your e-mail address and a screenshot. If you don't have internet connectivity, click on Save at the bottom. 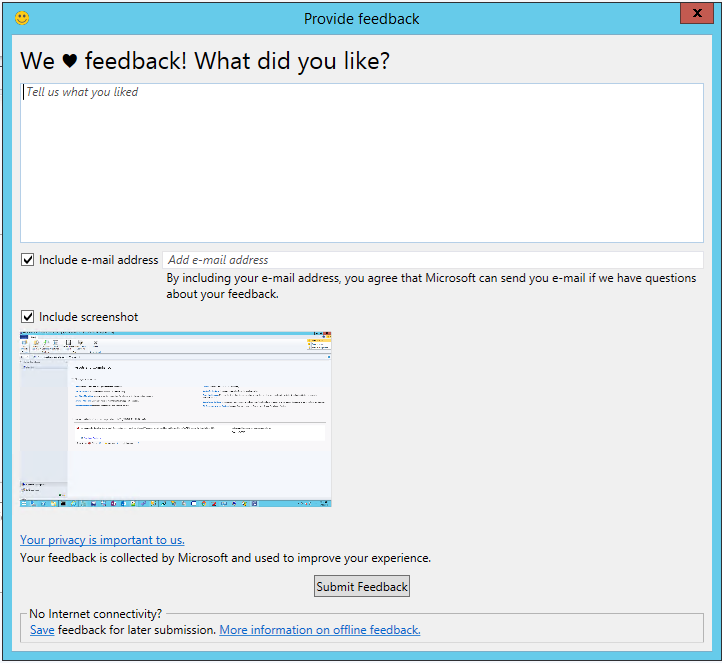 Follow the instructions in the Send feedback that you saved for later submission section to send it to Microsoft. In the drop-down menu, select Send a frown. Use the text box to explain what you didn't like. Noted - We understand the request and it makes sense. We've added it to our backlog. Planned - We've started coding for this feature and expect it to show up in a tech preview build within the next few months. Started - The feature is now in a tech preview. Go check it out, and give us feedback. Let us know if the feature is on the right track or not. Put additional feedback in the comments section of the original request for others to see and comment on. We’ll read that and use the feedback to try to improve the feature. We want you to know the feature is production ready. We want to give back your UserVoice votes so you can use them on other items. You can file new Design Change Requests to this feature to help us know the next most important improvement for this feature. Click on Save at the bottom of the Provide feedback window. Save the .zip file. If the local machine doesn't have internet access, copy the file to an internet connected machine. On an internet connected machine, open a command prompt. -t, --timeout Timeout in seconds for sending the data. 0 is unlimited. Default is 30. Starting in version 1902, when you send feedback through the Configuration Manager console or UploadOfflineFeedback.exe, it shows a confirmation message. This message includes a Feedback ID, which you can give to Microsoft as a tracking identifier. To copy the Feedback ID, select the copy icon next to the ID, or use the CTRL + C key shortcut. This ID isn't stored on your computer, so make sure to copy it before closing the window. Clicking on Do not show this message again will suppress the dialog box and prevent it from appearing in the future. The UploadOfflineFeedback command tool writes the FeedbackID to the console unless -s or --silent is used. The Configuration Manager engineering and partner teams use the Enterprise Mobility + Security blog to provide you with technical information and other news about Configuration Manager and related technologies. Our blog posts supplement the product documentation and support information.